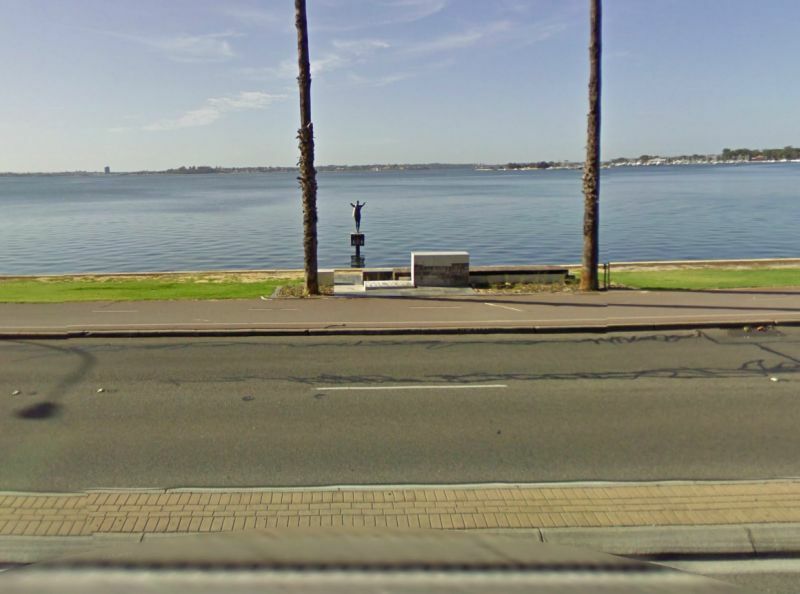 Before I start, it needs to be said, that this website is not just about the Eliza Statue, it's about random and positive acts by the people of Perth. The dressing of Eliza has become such a common and random event, and is a great way to get the website started. So please, send in any photos/video you have of any random acts that you have witnessed in Perth - info@randomperth.com. Have you ever found yourself wondering what this statue is about? Who is she, why is she diving? Well, because the Eliza Statue has been a large make up of this blog, we thought we should seek some of the answers. Courtesy of wikipedia and publicartaroundtheworld.com we have put together a brief summary of the Eliza Statue and why it was created. 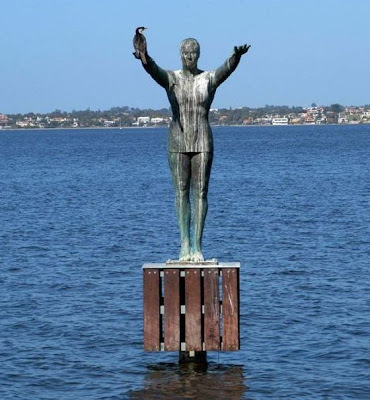 A 2.2 metre high bronze statue of a woman in bathers, with her arms up in the air, looking like she is about to dive off the wooden platform into the water. The artwork has it's own lighting from solar panels. Local artist Tony Jones and his son Ben were commissioned to create a fitting statue for the location. The Eliza statue commemorates the Crawley baths which were a popular place to swim between 1915 - 1960's. The baths were opened in 1914 and became a place where hundreds of children learnt to swim. Olympic legends Murray Rose and Jon Hendricks were Crawley bath regulars. 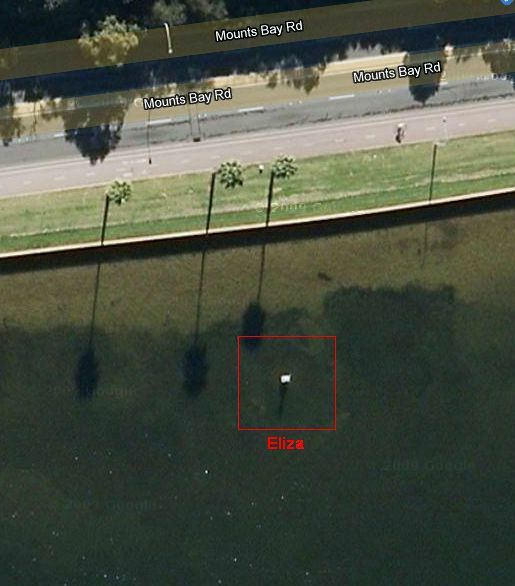 Eliza was unveiled by the exiting Perth Lord Mayor, Peter Nattrass, Monday 15th of October 2007. Included in the unveiling presentation was a male and female dressed in 1940's swim wear. 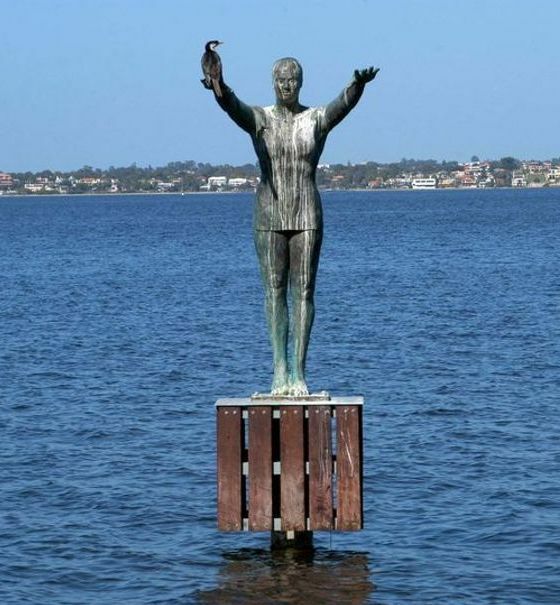 The statue is located approximately 15 metres off the shoreline, in Matilda Bay on the Swan River, Western Australia. 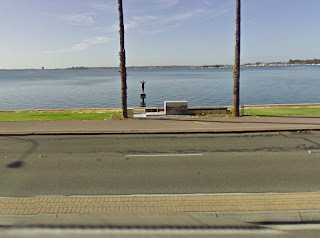 The photo's below are courtesy of Google, showing the aerial view of the statue, and location from the road. 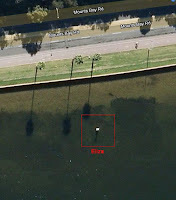 Click here to view the interactive Google street map showing the Eliza Statue. If you know anything else about the Eliza Statue you would like to share, please send us your comments below.